Before visiting Cairo in 2018, I was somewhat concerned about my travel safety in Egypt. In the end, my stay turned out to be very positive and I didn’t have any issues with security. However, I know that many other travellers are concerned about travel safety in Cairo and elsewhere in Egypt. Some even avoid Cairo and Egypt altogether. To help other travellers, I gathered available safety information on this blog post to answer if it is safe to travel to Egypt right now. 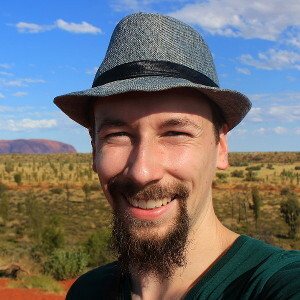 This information has been last updated in June 2018. Is Cairo Safe to Travel Right Now? As of June 2018, the Foreign Travel Advice of the Government of the United Kingdom advices against travel to certain parts Egypt. However, Cairo is not in any of those regions. The travel advisory of the U.S. Government tells a similar story. The U.S. Government tells visitors to exercise extra caution in Egypt due to terrorism. The travel advisory also asks people not to visit certain regions of Egypt. But once again, Cairo is not included in those warnings. While looking at all the travel warnings of Egypt, it’s easy to miss how rarely they concern Cairo. 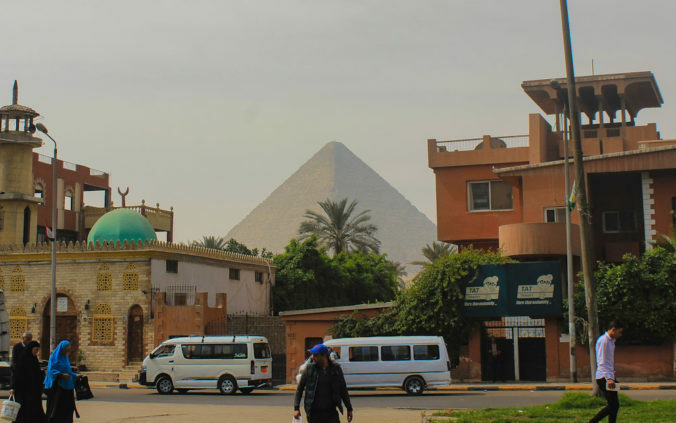 As Cairo is somewhat safer, it is left unmentioned in many travel advisories. In their safety and security section, U.S. Government describes crime levels in Cairo and Alexandria as “moderate”. Most crimes that target foreigners are “crimes of opportunity” such as pickpocketing. 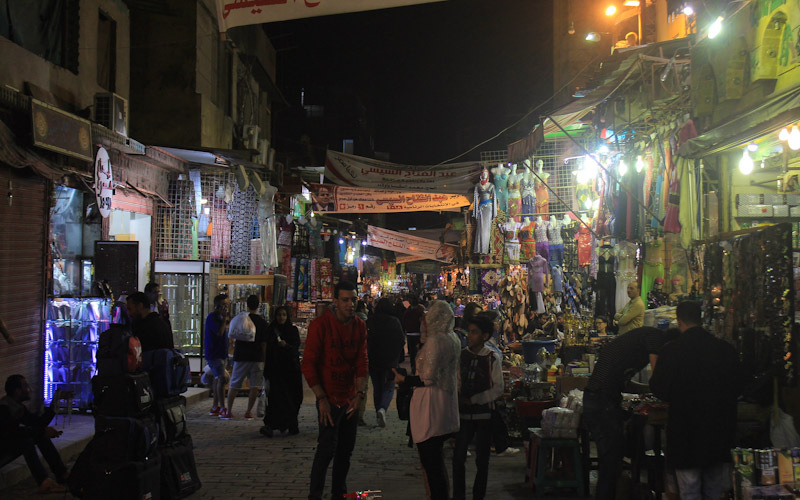 Exploring the markets of the Old Town of Cairo at night. 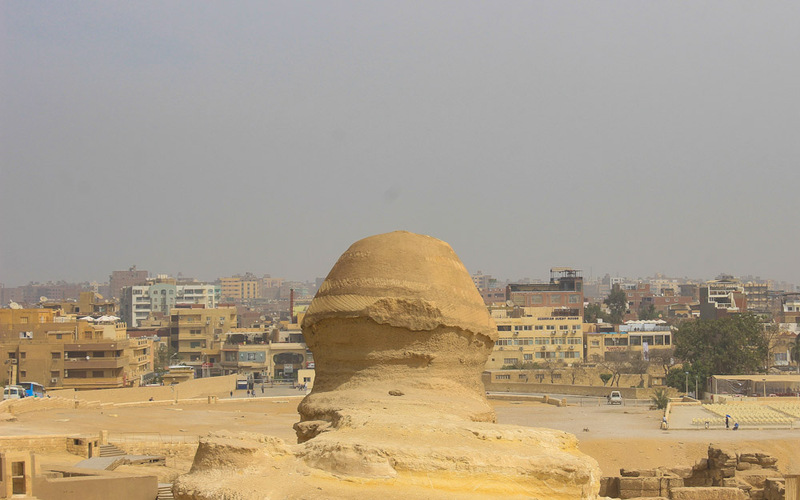 It is relatively safe to travel in Cairo, but what about the rest of the country? Is it safe to travel elsewhere in Egypt right now? Well, once you leave Cairo, you’ll have to be more careful about your destinations. The U.K. Government advices against all travel to North Sinai a region in the northeast of the country. They also advice against non-essential travel to South Sinai and the vast areas west of the Nile Valley and the Nile Delta – with the exception of a long stretch of the northern coast of the country. The U.S. officials warn against all traveling in the Sinai peninsula (except flying to Sharm El-Sheikh) and the Western desert because of terrorism. They also tell travellers to avoid Egypt border areas due to military zones. So, what areas of Egypt does that leave for travellers, then? Still quite a lot, actually. To simplify a bit, the western and eastern parts of the country are considered off-limits. However, the long middle stretch along the Nile is not listed in the travel warnings. I visited Cairo in March 2018. Do I think it’s safe to travel in Cairo right now? My short visit in Cairo doesn’t make me a security expert, but I can tell how I felt. Before visiting Egypt, I had spent the previous six months of my 2-year trip around the world in Latin America and Africa. I noticed one remarkable difference between those regions and Egypt. My local hosts and friends elsewhere were often worried about safety – both theirs and mine. For example, many people in the cities of South Africa were very wary of parks and walking outside after sunset. This wasn’t the case in Cairo. In fact, my local hosts constantly called Cairo a safe city. They said there was no problem walking in the Old Town after dark. In fact, they even seemed a bit fed up with foreigners who thought Cairo was a dangerous place. During one of our many conversations, I asked my local muslim friends their opinions about the safety of female travellers in Egypt. According to the website of the U.S. Government, harassment of women – foreigners included – remains a problem in Egypt. I’ve personally met female travellers who’ve been harassed in Egypt. One Egyptian friend of mine highlighted the cultural differences between the conservative muslim society and Western countries. According to him, many local men may falsely interpret very open communication of Western women as flirting. Same goes for too revealing clothing. My friend said it would be very stupid and risky for foreign women to wear revealing clothes during their visit in Egypt. These are, of course, only the opinions of one person. However, they can give an idea about the culture of Egypt. Heavy smog over Cairo. The pollution is probably the biggest health hazard you’ll face in the city. Is It Safe to Visit Cairo in 2018? So, is Cairo safe to travel in 2018? While I cannot give a definite answer, I hope this post has given you some ideas about the safety situation in Egypt. While I cannot guarantee your complete safety, I can say that most tourists who visit Cairo don’t have any issues with their safety. For me, Cairo felt much safer than many other cities in Africa. Egypt is a beautiful country that has a lot to offer. While it’s good to know the risks, I hope that your safety concerns won’t completely stop you from visiting Cairo and Egypt. Hi, while I am business and private wise regular travelling in Egypt by Ask Aladdin I can tell you Cairo is very safe to go in March, just before the real heat comes depending on your time to spend and you can stay downtown in hotels like Sofitel, Novotel, Hilton Zamalek, which are great and convenient. Near the Pyramids Menna house with an excellent view is nice. Plenty pluss of possibilities. Uber moves you easy to any place. Or from the hotels, you book daily tours.